When China surpassed the US in terms of smartphone shipment volume in Q1 2013, it was evident that the comfortably ruling mobile market of the US was facing fierce competition. The UK and US were no longer the sole focus of advertisers, and a willingness to expand to China was being fuelled. 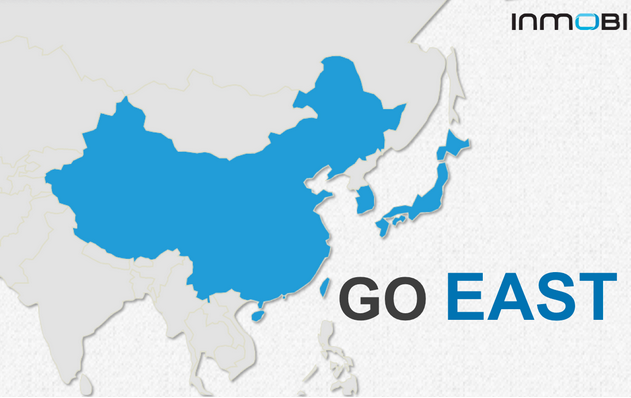 At InMobi, we see China as only a part of a bigger opportunity of the Eastern mobile markets as a whole – China, Japan, Korea, Hong Kong, Taiwan, and SEA. The common perception of Eastern mobile app markets being too different from those in the West keeps developers from expanding to these markets. Truth is, they’re not all that different. 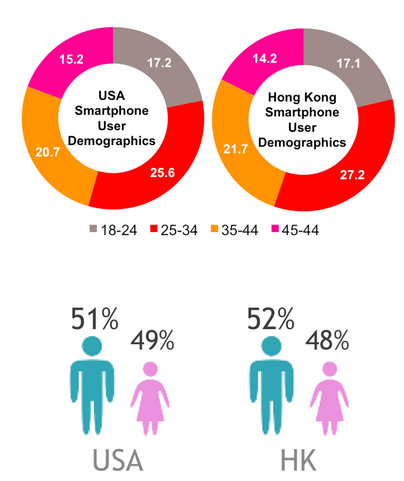 Smartphone User Demographics: The similarity between the smartphone user demographics in the US and Hong Kong is uncanny, with males in the age group of 25-44 forming the majority. Usage Behavior: The categorical app and mobile usage behavior of the users of these countries is similar in one too many ways. 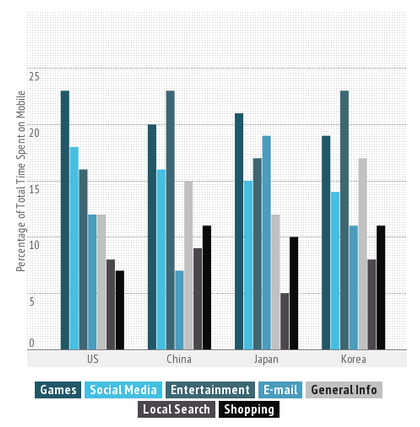 Besides gaming, social networking, and mobile chat apps are the fastest rising apps in these markets. Android on the Rise: These Eastern markets are predominantly Android markets and a larger share of the revenues comes from Android downloads. Having taken over iOS app downloads in the US, Android is emerging as the biggest market in the US too. 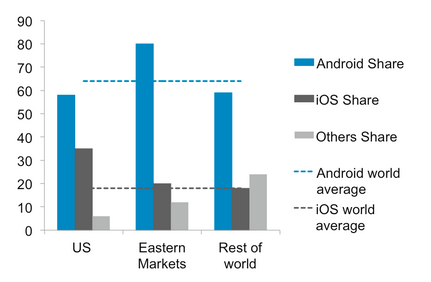 Figure 3: Android and iOS share comparison. Strong consumer acceptance of mobile ads in both markets: A little over half (52%) of Chinese smartphone users are receptive to mobile ads equally or more so than TV or PC, and a significant two-thirds (65%) in the US are open to mobile advertising. This trend is prevalent in all other Eastern countries as well. Localization is crucial but highly misunderstood: It is a common mistake for app developers to assume that translating their dialog and text into the local dialect is all there is to localization. While it is an integral part of the process, the actual challenge lies in embedding the very cultural influences of the country in the app; in the look and feel of it, in the gameplay, and in the theme. This makes your app instantly accessible and appealing to the audience. Integrating the local social networking sites (Sina Weibo, Tencent in China) in your app can also help achieve popularity through social marketing. The result: 28% uplift in revenues and 128% uplift in downloads for the localized apps – all worth the effort. 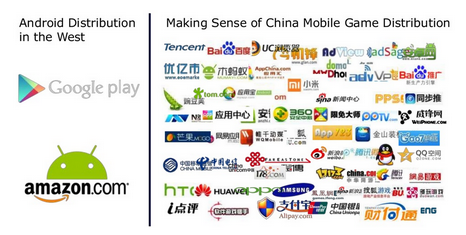 The Complex Case of App Store Fragmentation: Two stores in the west are about 200 in China. 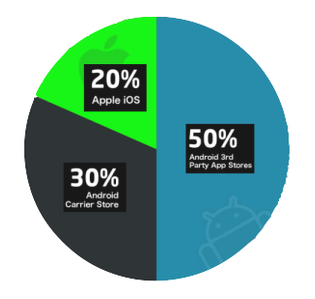 This paints a clear picture of the crazy extent of app store fragmentation in the Eastern markets. Since 80% of the revenue comes from these third party app stores and carrier app stores, this craziness really cannot be ignored. The right approach is a perfect balance between scale and ROI. Launching to the top app stores can help achieve the right scale at decreased cost and effort, maximizing ROI. Another important thing to keep in mind is that there are different app store segments based on cities, specific demographic markets like married women with kids, specific categories like gaming, and so on. Careful selection of app stores based on the kind of apps you make can also really make all the difference. With the combined download volume of these markets closing in on 7 billion in Q1 2013, and 370 million users waiting to download your app, one cannot ignore the huge potential that lies here. Watch this space for more as we help bridge the knowledge gap via comprehensive infographics on the mobile markets of each of the Eastern countries.